As one of its final actions of the year, the Alaska Legislature approved a statewide ban on smoking that will affect most workplaces, including bars and restaurants. It also restricts smoking in some outdoor places. Senate Bill 63 has been a long-in-the-works effort to more tightly limit employees’ exposure to secondhand smoke. It was authored by Soldotna Sen. Peter Micciche and eventually more than half of all legislators signed on as cross-sponsors. It passed the Senate 15-5 and the House 32-7. It now heads to Gov. Bill Walker, who’s already praised its passage, to be signed into law. Here’s a rundown of just what the bill will mean for you. Smoking in pretty much any workplace whether it’s a public-facing business like restaurants, bars and music venues or more closed to the public like an office or hotel room is also banned. The new law will also ban smoking outdoors at open-air venues like the seating area of outdoor concerts and sporting events, as well as near entrances to buildings affected by the ban and near playgrounds when children are present. Smoking on public transportation or in shared work vehicles would also be banned. The rule of thumb is: Does someone work there? Then it’s banned. Retail stores, malls and shopping centers. Any government building whether it’s state, local or a regional school. Bars, restaurants, hotels, motels and office buildings. Common areas of apartment buildings or multi-family housing units. Entertainment venues and sports arenas. Buses, taxicabs, ferries or any other vehicle used for public transportation. Public bus depots, bus shelters and airport terminals. Public or private educational facilities. In a building where paid child care is provided, whether or not children are present (though it doesn’t bar smoking in another private residence that shares the building with the child care provider). Outside within 10 feet of an entrance to a bar or restaurant that serves alcohol. Outside within 20 feet of entrances, windows or ventilation system of any other building affected by this ban. Outside anywhere on a health care facilities campus that’s been designated smoke-free. Marijuana is already banned from being smoked in any public place or business. If the Marijuana Control Board creates regulations to allow on-site consumption of marijuana, the law would allow it as long as it is in a freestanding building and if it shares the building with another business has a ventilation system so the smoke doesn’t cross over. Thanks to the legislation’s lengthy time in committee, particularly at the hands of the few legislators who’ve remained skeptical of the state’s role in regulating smoking, has included quite a few exemptions for where smoking is still allowed on the job. The bill never affects a person’s ability to smoke in their private residence. Smoking in a work vehicle that is used exclusively by one person, unless prohibited by the owner, is still allowed. On a commercial or sport fishing vessel, unless prohibited by the owner. Airports and other transportation hubs can still allow smoking in separate enclosed smoking areas. Private clubs that have been operating continuously since Jan. 1, 2017 at the same location can still allow smoking as long as it’s not licensed to serve alcoholic beverages and is not a place of employment (this exemption is specifically targeted at VFW halls). If the owner allows it, smoking or use of e-cigarettes would be allowed in tobacco and e-cigarette stores as long as they’re either in a free-standing building or if they share a building have a separate entrance and a ventilation system that ensure the smoke or vapor doesn’t cross over to the separate stores. All e-cigarette stores that have been operating since Jan. 1, 2017 would also be protected. Smoking in standalone enclosed shelter as long as it doesn’t serve food or alcohol. The fine for a first-time infraction is a $50 fine. Businesses that fail to post these signs will be liable for a fine between $50 and $300. Retaliation by a business against an employee trying to follow the law would also be punishable by a fine of up to $500. For each day the violation continues after the filing of a citation constitutes an additional violation, according to the law. How’s it going to be enforced? The primary enforcement will be left up to the Department of Health and Social Services and operate through a complaint-driven report system. The department will need to set up a reporting system for the public or employees to report possible infractions of the law, which the department would investigate and file citations for. Police officers would also be able to issue citations under this law if they witness an infraction in-person. What’s it going to cost the state? Despite concerns from legislators about costs, the state doesn’t anticipate any additional costs to enforce the system or provide signage to businesses. 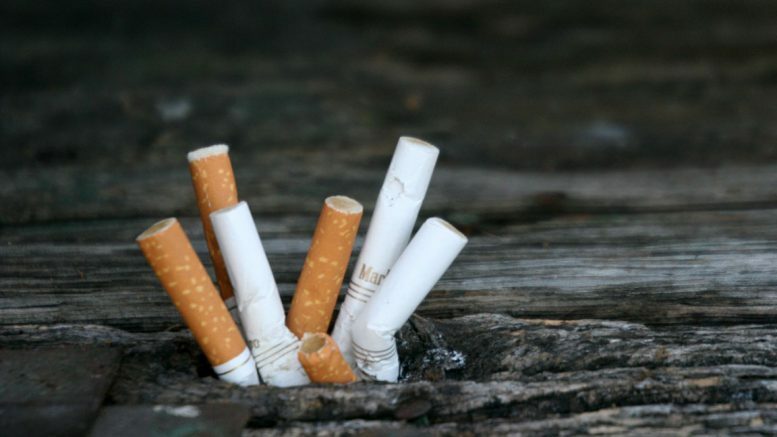 The Department of Health and Social Services already has the Tobacco Enforcement Team, which responds to municipalities that already ban smoking and underage smoking. The department notes that this type of complaint-drive enforcement is relatively passive and doesn’t generate many complaints. As far as signage, the bill is not entirely clear of whether the state will need to provide electronic signs or something durable. Either way, the state doesn’t anticipate any major additional costs because the digital signage would be cheap to create and distribute, and durable signage could be distributed through the state’s grantees and contractors could refocus their efforts to provide the signs with existing money. Can communities opt out of the ban? Yes. Thanks to a change made by House Rules Committee chair Rep. Gabrielle LeDoux, R-Anchorage, municipalities and villages may opt out of the statewide smoke-free workplaces ban through a local election. Villages can also petition the lieutenant governor for a special election to opt out of the ban if 35 percent of registered voters sign onto a petition, which stays in place for two years. 2 Comments on "Here’s how Alaska’s statewide workplace smoking ban will work"
This process has indeed taken far too long to get to Governor Walker’s desk for his anticipated signature. But the end result is a big win for public health and secondary, a win for business because a smokefree policy is good for health and good for business in the overwhelming amount of venues where a smokefree policy has been enacted. The fact remains that due to House Rules Committee chair Rep. Gabrielle LeDoux’s individually refusing to allow SB 63 out of her committee for years although the bill had overwhelming support of both sides of the aisle, there is no doubt many lives will be shortened – and that is on her. I find it reprehensible that the Alaskan government condones one obstinate elected official to have the ability to be a sole controlling force to negatively affect the health and safety of so many Alaskans. My daughter, who suffers from Asthma, works in a building where the owner smokes in her office and they have a central air system so she is affected by it. There are some days where my daughter is sent home because she can’t breathe! I don’t think this is fair at all and she worries that someday she will get lung cancer. What can I do, what can she do without losing her job!